Jet skiers and people in motorised boats have been urged to keep away from a dolphin who has been swimming off the coast of Kent for the past year. Dave has boosted the tourist trade in Folkestone since he was first seen last April 100ft (30m) out to sea on the reef between Folkestone and Seabrook. But Kent Police said there had been several reports of people getting too close to him during the Easter weekend. "Dolphins are wild animals and should be treated with respect," police said. Dave has attracted hundreds of visitors to Folkestone and was given a tourism award in November by Kent Tourism Academy in Hythe. A website devoted to him has received more than 300,000 hits a month and T-shirts and other memorabilia have been sold for charity. But police are asking the public to help protect him by reporting any behaviour that may cause him harm. 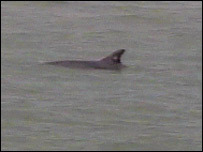 The Kent Police Marine Unit, which patrols the coast, said action would be taken against anyone seen annoying him. Pc Andy Small said: "Boats, jet skis and kayaks should keep a distance of about 100m from the dolphin and people must not approach, grab, touch or try and swim with him." He was forced to make a similar appeal to tourists last September after kayakers were seen harassing Dave.